In 1991 Kalman worked with Amnesty International’s senior lawyer Claudio Cordone in Jerusalem. During a six-month term several meetings between officials of the Israel Ministry of Justice; the International Committee for the Red Cross and Amnesty International were convened in East Jerusalem. Claudio and Kalman met frequently at the American Colony Hotel to review specific cases on human rights abuses in Gaza and the West Bank. The Catholic Near East Welfare Association recognizing Kalmans special contribution to conflict resolution awarded him a special trip to the Vatican. 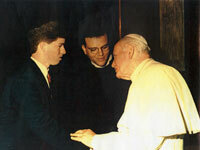 Kalman joined other student leaders from Europe in a private session with Pope John Paul II in the summer of 1991. The Catholic Near East Welfare Association is the papal agency for humanitarian and pastoral support that serves the churches and peoples of the Middle East, northeast Africa, India and Eastern Europe. Upon returning to New York in 1992 Mr. Sporn set up the Young Leadership division of Americans for Peace Now. Prior to the historic agreements signed by the late Yitzchak Rabin and the late Yasser Arafat public opinion was decidedly against acknowledging the PLO as a partner for peace. 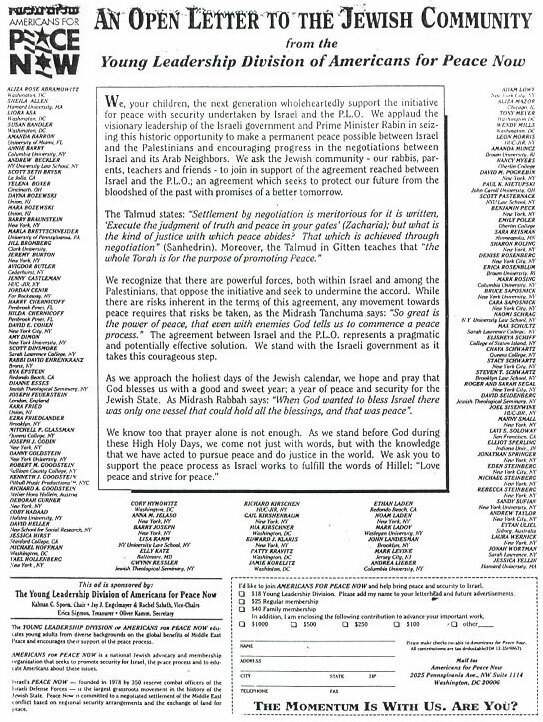 Kalman published full-page ads in local US papers calling for greater support and recognition of PLO and Israeli cooperative interests. The ads were signed by children of important US business leaders and sponsored by Americans for Peace Now.